It’s that time of year again, a time to think about how awesome of a year it was, and how you want to make next year even better. I don’t think I really took the idea of making New Year resolutions seriously, until this year. I think whether you keep them or not, New Year resolutions are a good way to find out who you are, and who you want to be. Taking the time to think about these things will only help make your entire life better because you are working to make yourself happier, and when you are happy you have a better opportunity to make the people around you happy. So, what are my resolutions? Some of them, the classics if you will, are to take care of myself health-wise as much as possible. Starting with actually working out in the gym with the membership I have been paying for, of course this is in addition to my more regular (and fun) workout of dancing when I go out with friends. I want to give myself the time to read more, and I already started with an incredible new library of books I bought myself with gift cards from Christmas. I also want to give myself time to relax more, I hardly ever allow myself to slow down…which is fun, but not for my health or my need for sleep. I want to meet a lot of new people next year. I read in The Diary of Anais Nin: 1955-1966 that when Nin met Marilyn Monroe at a party, despite many people from the press being there, Marilyn Monroe showed up wearing no makeup and completely dressed normal, not dressed to the nines like other starlettes. Nin also said that Marilyn Monroe had such an incredible gift to give you all of her attention when talking to you, and making you feel like you were the only person in the room. I want to be like that. I want to be able to give everyone I meet my full attention, and really get to know people even when first meeting them. Although I did a great job of it this year, I want to go on more adventures, go to more shows, and continue to find new music to share with the world. Anais Nin said, “We have the right to select our vision of the world. It is important that our external reality expresses our inner reality, our character,”. Taking the time to think about who we are on the inside and making goals to better ourselves is only a great way to start the New Year. I will definitely try to keep all my resolutions, as well as make more over the course of the year. I hope everyone has a happy and safe New Year’s Eve celebration! 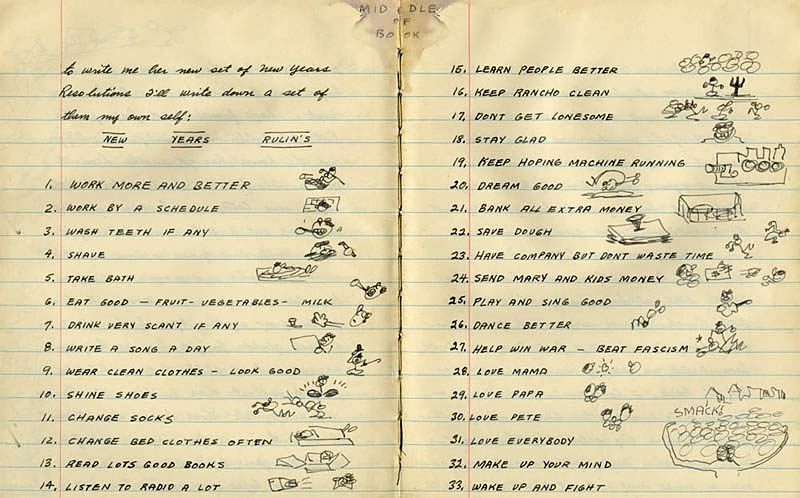 To end I would like to show you Woody Guthrie’s New Years Resolutions from 1942, as well as the super cute Zooey Deschanel and Joseph Gordon-Levitt rendition of “What are you doing New Years Eve?” (can Joseph Gordon-Levitt get any dreamier?). Tags: 1942, 2012, Friends, fun, Joseph Gordon-Levitt, music, new music, New Year resolutions, new year's eve, Woody Guthrie, Woody Guthrie's New Year Resolutions, Zooey DeschanelCategories: inlust., justlisten., lovelovelove.